Alex and I took a trip to Chicago on August 8 through 11, 2016. Partly the trip was because I was homesick; I hadn’t been home in six years. But part of the trip was because my now-ex has most of our photographs from our previous trips to Chicago. 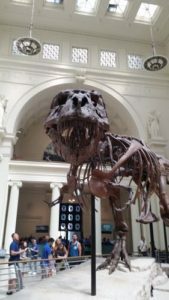 I started writing about Chicago destinations in past posts, but since my ex has the pictures, I couldn’t post any pictures with them. So here are a few pictures that I will, ideally, be moving to those posts, and probably a few more that I’m particularly fond of. 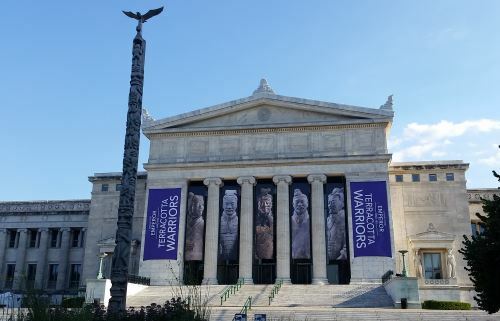 First, is the Field Museum of Natural History. Arguably my favorite museum in Chicago (if it’s not my favorite, it’s a very, very close second to the Art Institute of Chicago). I’m not sure which image(s) I’m going to use, so I’ll post three of my favorites here. I reserve the right to come back and say, “Ooh! Here’s another nice one!” at some later date. The Field Museum of Natural History, Chicago, Illinois, 2016. Alex and I were in the Museum Campus until after the museums closed so I was able to get this nice photograph of the north entrance without any people in it. The Lions of Tsavo, two of the most famous “residents” of the museum. 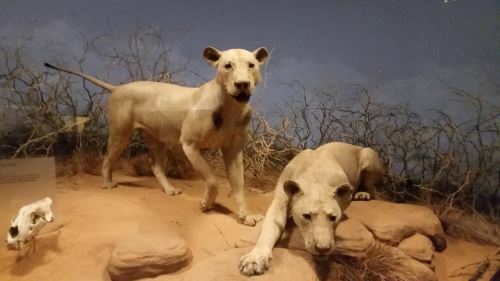 These lions (well, the lions that used to wear these skins) killed and ate around 35 people in Tsavo, Kenya, in the 19th century. The lions’ skulls are also on display in the same case. You can see one of the skulls there in the lower left-hand corner. Millennium Park was my next post, so here are a few of my favorites from there. I will definitely include the first image because I attempted to describe it in the post and failed miserably, so why not include a photo? 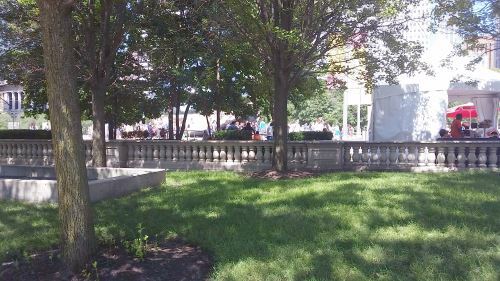 The back of the plot of land that eventually became the westernmost part of Millennium Park had a wall similar to this along the back of it. I spent several minutes trying to find the best reflection of the skyline on the Cloud Gate (also known as the “Bean”), but didn’t find any that really spoke to me. Maybe later, after further examination, I’ll find one, or maybe I’ll just have to make the sacrifice and go back to Chicago at some point other than the height of the tourist season (imagine a fake sigh here). 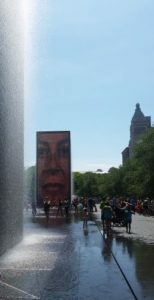 So, instead, here’s one I really liked of the Crown Fountain. I think I’ll stop here for now and return to this topic in two weeks or so with photos from the Art Institute of Chicago and Grant Park, also perhaps of Lincoln Park, though most of those pictures I took were of the zoo, which I haven’t posted on yet. And then, two weeks or so after that, we’ll go forward with (in two-week increments) Lincoln Park Zoo, the Adler Planetarium, the Shedd Aquarium, the Chicago Botanic Garden, and some of the highlights of Chicago architecture. We should be in November by then. I’ve run some numbers and it looks like I’ll be able to return to Chicago to take photos of the Museum of Science and Industry, the Oriental Institute and perhaps some suburban destinations, in 2018 or 2019.